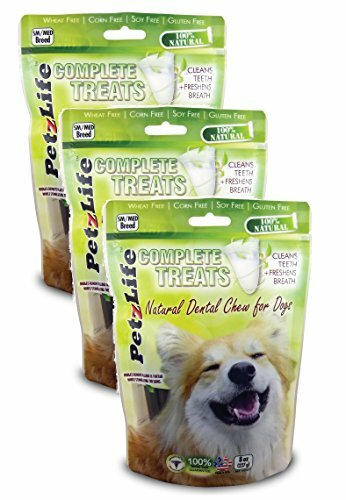 PetzLife Complete Treats are veterinarian-formulated and use the active ingredients found in PetzLife Oral Care Sprays and Gels. Complete treats are made with nutrient-rich, natural ingredients and are wheat-free, soy-free, and corn-free. Complete Treats are also low in calories and contain dietary fiber, making them easy to digest. Give daily as a treat to keep your dog's teeth clean and breath fresh! Veterinarian-formulated Complete Treats clean teeth and freshen breath! Functional, tasty, and made with nutrient-rich, natural ingredients. Wheat free, corn free, soy free, and no artificial flavors or colors! Complete Treats are low in calories and rich in dietary fiber, making them easy to digest. Ridges remove plaque and tarter while stimulating the gums.